The latest indie-rock buzz band, everyone from Rolling Stone on down has praised The Yeah Yeah Yeahs. With good reason, too. 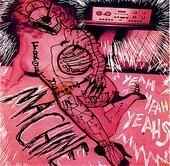 Machine, the band's 3-song EP, is thrash-y rock 'n' roll with plenty of punk upbringing, a mixture of noise and fury coming together to a nearly-dissonant melody. But they pull it off, creating a swirling, messy array of sounds and textures that play with your head as you rock out and absorb it all. Though, three songs and 7 minutes of music, hardly a reason for a CD. Save it for the 7". I'll give it a B.
Yeah Yeah Yeah's: Fever To Tell Yellow Machinegun/Stormtroopers of Death: Split 7"